Every year for as long as I could remember I’ve gone to the spring and fall shows in Rountop/Warrenton, TX. It wasn’t far from our home of Bryan and for me it was always a ceremonial decorating jumping off point for the spring and fall seasons. 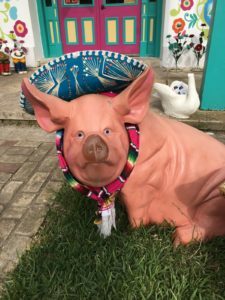 I still have people ask “What is Antique Weekend?” and my best description would be when hundreds of antique peddlers, collectors, artists and junkers come from all over the country to sell their finds and creations. 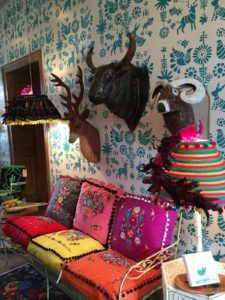 It’s miles and miles of salvaged architectural pieces, rugs, recycled and up-cycled pieces, collector pieces, lighting, food…the list really does go on and on. I often say if you can’t find it during antique week then it doesn’t exist! Designers from all over the country come to buy for homes and storefronts and bargain for those unique pieces that only Antique Week offers. 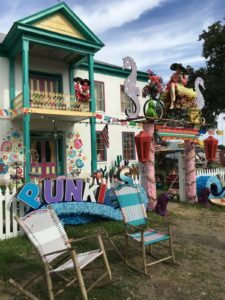 One vendor that I thought to be exceptionally creative, funky, fun and had the Mexican flare that I’m always attracted to was called Punkies Place located in the heart of Warrenton. Punkies really inspired me as a decorator and I can’t wait to reproduce her genius in my own home this Christmas. The picture below was of the stairwell at Punkies. 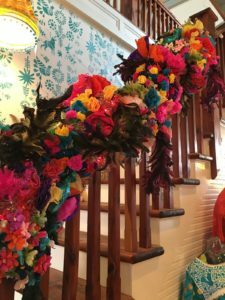 She used a metallic pink garland base then loaded it with paper flowers, glittered birds and pink lights….Fun Fun Fun!!! I can’t explain the draw in words other than for me it’s inspirational. I see how others take something ordinary and create something visually awesome. It also reminds me of the “good ole days” and often transports me back to my childhood days with Shiney Bright ornaments and weathered paint layered furniture. It’s my mecca, my favorite destination twice a year and a part of who I am today as a designer. See you next year at the spring show!